ABS sellers across Europe approached the market with increases for June following the higher butadiene and barge styrene contracts, according to ChemOrbis. However, another styrene contract settled with rollovers on an FCA basis afterwards, which caused buyers to take a waiting stance in anticipation of a correction in hike requests for ABS in the upcoming days. Trinseo announced increases of €40/ton on their June ABS prices in Europe, according to a statement on the company’s web site. 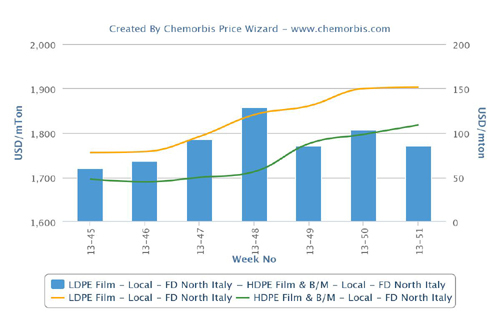 In France, a distributor issued increases of up to €40/ton on his June ABS prices for West European material, commenting, “Trading activities are quite weak as converters consider the current prices to be too high.” Another distributor lifted his ABS prices by €20-30/ton for June. A converter reported receiving June ABS offers with rollovers to increases of up to €40/ton from May. A packaging producer in Germany reported receiving June ABS offers up €40/ton from last month. The buyer said that he is planning to wait before making new purchases, assuming that some price relief might be possible in the days ahead.